It was the most beautiful action I’ve ever been a part of. 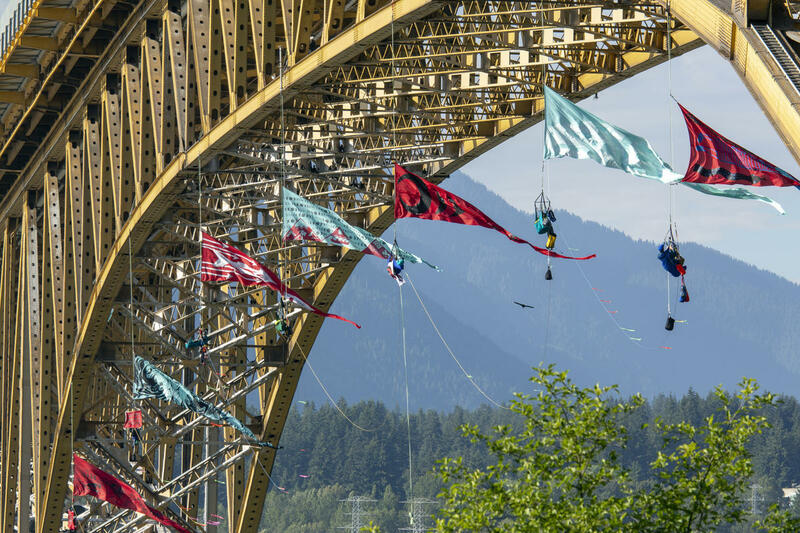 For over 36 hours, six other climbers and I hung from the Ironworkers Memorial Bridge in Coast Salish Territories (Vancouver), putting our bodies in the way of a massive tar sands oil tanker and preventing it from passing through. 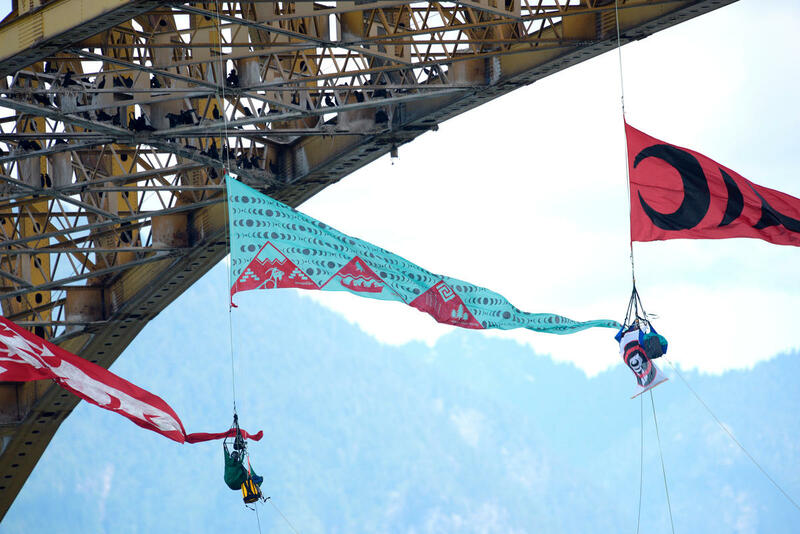 Above us flew seven giant pennants, each designed by an Indigenous artist from some of the Indigenous communities leading the fight against the dangerous Trans Mountain Expansion pipeline and tanker project. Each one of those pennants was (and still is) a symbol of resistance and hope. Each one a constant source of inspiration for all of us. Five other people supported us from the bridge. The entire team was made up of three Albertans and people hailing from British Columbia, Ontario, Quebec, the U.S.A. (Seattle), the UK, Mexico, Coast Salish territories here in Vancouver (Will George who is a Coast Salish community member who has been leading opposition to this project from Burnaby Mountain). We were all there for many reasons, some shared and some our own.That motivation helped us scale the bridge, overcome our nerves, and risk arrest. For me it was because I’ve seen the damage oil spills can cause. I was there just after a pipeline burst into the Red Deer River, risking the water supply of a city of over 100,00 people. I was also with my friend and colleague when a pipeline ruptured in her community of Little Buffalo (one of the largest spills in Alberta’s history). I felt the helplessness she felt as community members called her asking for help that the government and the company never provided. Those experiences stay with you. I’ve also seen the damage being done up north in the tar sands. 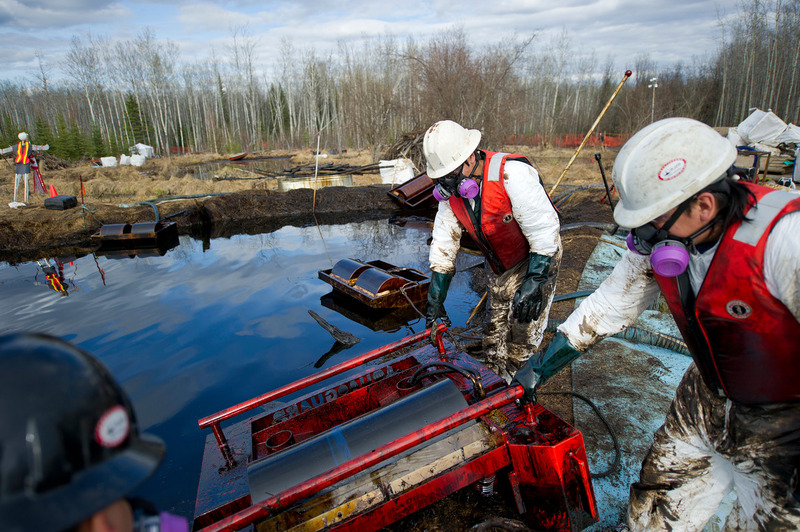 I’ve seen entire forests turned into barren moonscapes, and lakes full of toxic chemicals — all for the pursuit of oil. We have more choices for how we get our energy and how we travel. We have more choices for how to create jobs and build economies. And we have a choice about whether or not we repeat the mistakes of the past and compound the damage that’s already been done by reckless oil extraction. The Trans Mountain pipeline expansion is the wrong choice. It violates our commitments to climate change, it breaks our commitments to Indigenous Peoples, and it threatens water resources all along the pipeline route. With the roughly 400 tankers it could bring to the Vancouver coast every year to load up and transport tar sands oil to U.S. refineries it also threatens the entire west coast — including the economies, communities and the hundreds of thousands of jobs that depend on it. Prime Minister Justin Trudeau promised climate action. He promised to respect Indigenous rights, including Indigenous Peoples’ right to consent (or not consent) to projects that impact them. He promised to fix the broken review process but they he put the Trans Mountain pipeline through the broken one anyway. He promised to end fossil fuel subsidies and he promised to protect this coast. If he continues to push this project, he will have violated all of these commitments. I wish that the Prime Minister would have just lived up to his promises. I wish he wouldn’t have caved to the oil lobby and instead maintained the courage he showed in Paris. I wish the Haida tattoo he has on his shoulder meant Indigenous voices would be prioritized and that he wouldn’t betray his promises to Indigenous reconciliation. I wish, when they chose to abandon their failing pipeline project, he would have simply let Kinder Morgan walk back to Texas rather than pledging to spend $4.5 billion in public funds to bail them out. I wish he could see the better ways that money could be spent. I wish for all of those things — but that’s not the reality we live in. So last week, I spent over 36 hours hanging from a bridge to try to help the Prime Minister live up to his promises. I wish I didn’t have to do it (I don’t really like heights) but here we are. When I asked myself what would I do to protect the things I love, that’s the answer I came up with. The thing the Prime Minister doesn’t understand is that there are a lot more people like me willing to put their bodies on the line to stop this project. They’re doing it because there aren’t many other options when even the Prime Minister turns his back on his national and international obligations. Like me, they’re doing it because this project endangers the things they love as well. There’s still time to make the right decision and reject this pipeline, Justin. But if you don’t, we will be here waiting for you. We aren’t going away. Sign the petition calling on Justin Trudeau to stop the Trans Mountain pipeline buy-out. Thank you for your courage. Onward! Thank you for this bold and beautiful action. The world is watching. Wow....you guys got guts !!! !